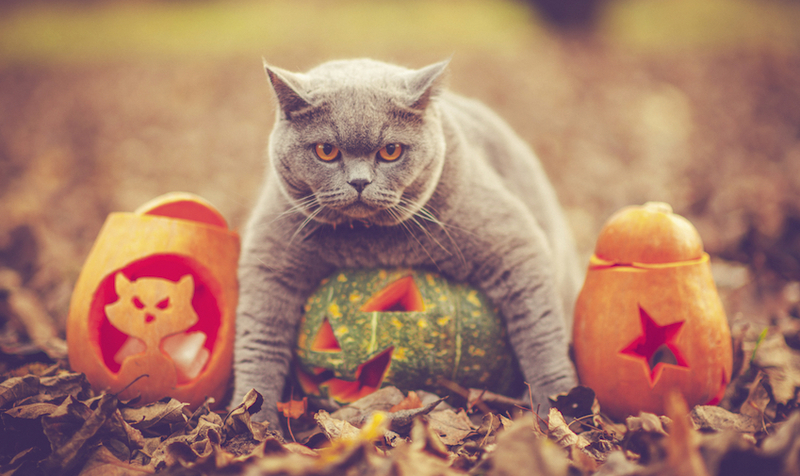 Top 5 Halloween Pet Safety Tips - LifeLearn Inc. : LifeLearn Inc.
Halloween may be a fun-filled holiday for pet owners. Yet unfamiliar noises, candy and unexpected visits from trick-or-treaters are just a few things that can create stressful, frightening and even dangerous situations for pets. Your pet may have the wizardly ability to melt the steeliest resolve with puppy-dog eyes, but do not give in and give your pet Halloween candy. Many Halloween treats safe for human consumption are toxic for pets. Xylitol (a sugar substitute found in candies, gum, baked goods and other foods) can be lethal for dogs. Xylitol is rapidly absorbed into a pet’s bloodstream and can cause hypoglycemia (low blood sugar), liver failure, seizures and even death in dogs. Also, chocolate can be fatal to dogs and cats, and the darker the chocolate, the more toxic it is. If you want your pet to enjoy a few Halloween goodies, make sure to buy treats that have been specifically made for pets. A candlelit jack-o’-lantern can pose a burn risk to pets, whether by accident or curiosity toward a flickering flame. As well, a knocked-over jack-o’-lantern has the potential of starting a fire. If you can’t imagine Halloween without a candlelit pumpkin, place jack-o’-lanterns out of reach from your pets to ensure that both your pets and pumpkins are safe. To avoid the burn and fire risk altogether, there are many attractive ways to light your pumpkin without a candle, from glow sticks and mini LED light strings to battery-operated electric candles with the flicker and glow of real candles. Whether dressed as Darth Vader or Spider-Dog, pets pretty much take the candy apple when it comes to looking adorable in a Halloween costume. However, many pet owners don’t realize that not all pets are okay with wearing a costume, and even for pets who don’t initially mind, the wrong kind of costume can cause distress. Make sure the costume allows your pet to move and breathe easily. Beware of potentially dangerous costume elements like ribbons, buttons or frills that can be chewed off and choked on by pets. Leave your pet’s head free. You wouldn’t want to walk around all night with a hat pulled down over your eyes or big deely bobbers knocking on your noggin, and your pet probably doesn’t like the idea either. Even with all these precautions, if your pet shows any signs of stress, don’t force your pet to keep wearing the costume, and remove it right away. Due to the sheer volume of people out trick-or-treating, it’s a good idea to keep your pet indoors rather than leashed outside. This helps ensure that your pet doesn’t get stressed out by being on constant high alert from all the strange passersby. Also, to minimize the risk of your pet getting spooked and escaping out the front door while you’re handing out treats, it’s best to contain pets in another room or behind a barrier like a child’s safety gate. Should your pet become lost after bolting out the door, proper pet identification increases the chances of your pet being returned. While traditional metal tags on collars remain a widely used form of pet identification, research from a published national study by Ohio State University shows that animal shelters housing lost pets implanted with microchips were able to find pet owners in almost 3 out of 4 cases. Whichever form of pet identification you choose, Halloween is the perfect time to make sure that identification is up to date. Witch-ing you and your pets a great Howl-oween!